T-R PHOTO BY ROSS THEDE - Marshalltown Community College freshman Tyler Coleman, right, is greeted at home plate by Ryan Carter after hitting a grand slam during the second inning of game two of Sunday’s doubleheader against Southwestern at Shawn Williams Field. 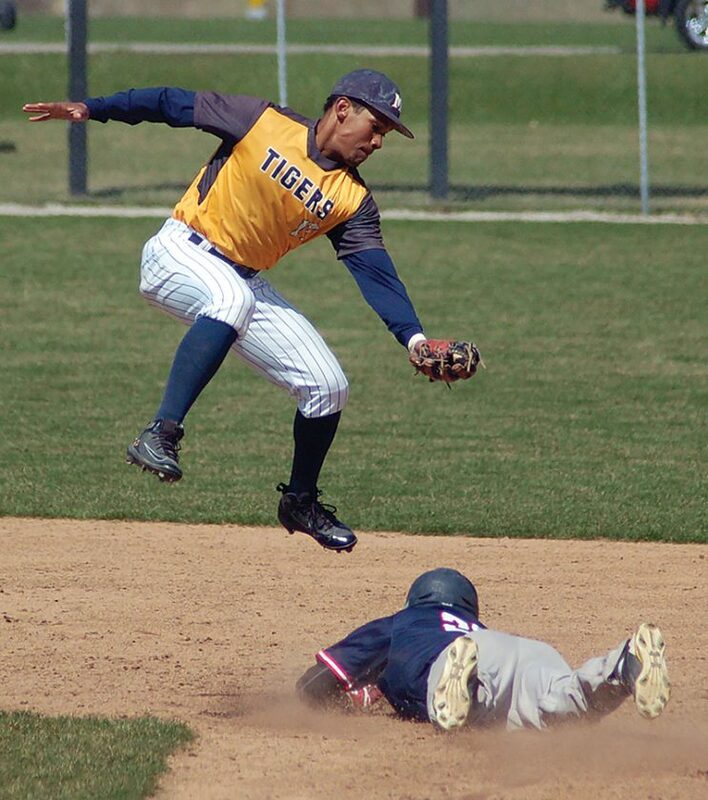 The opportunities that escaped the Marshalltown Community College baseball team in the first game of Sunday’s doubleheader against Southwestern never got a chance to get away from the Tigers in game two. MCC took full advantage of the scoring chances it created in the nightcap, earning a split with the Spartans for the second day in a row in an Iowa Community College Athletic Conference doubleheader at Shawn Williams Field. A day after falling 5-4 in the opener before winning 14-4 in a five-inning finale, the Tiger baseball team lost to Southwestern 5-3 before battering the Spartans 19-1 in a five-inning nightcap. MCC focused its aggression at the plate and turned good at-bats into positive results in the second game. The Tigers (6-20, 4-7) pounced for eight extra-base hits, including three home runs — highlighted by freshman Tyler Coleman’s grand slam. Coleman completed the day 4-for-6 at the plate with a double, a home run, four runs scored and seven RBIs, boosted by his bases-loaded blast to right-center field in the second inning of game two that gave MCC a 9-1 lead over the Spartans (6-23, 3-9). T-R PHOTO BY ROSS THEDE - MCC shortstop Candido Encarnacion, top, makes a leaping grab and attempted tag as Southwestern’s Levi Avery steals second base successfully during the fifth inning of game one in Sunday’s twinbill. Marshalltown rapped out 16 hits in 27 at-bats in the second game (.592) while also benefiting from nine walks and two hit batsmen by Southwestern’s five pitchers. The Tigers chased starter Matt Smith after one inning by scoring four times in the bottom of the first inning, sparked by a leadoff home run from University of Central Florida commit Tom Josten and a three-run blast by designated hitter Nick Hagen. Coleman’s grand slam chased SWCC reliever Quincy Collier from the bump before he could get an out five batters into the second, and the Spartans cycled through three more pitchers before the beatdown came to an end a couple innings early. Davila surrendered just two hits over five innings for the Tiger pitching staff, striking out five while walking two. The left-hander didn’t allow a hit until Cade Cox’s two-out infield single on a slow roller to third in the top of the fourth inning, and Chris Palomo followed with a run-scoring bloop single to right for the Spartans’ lone run. 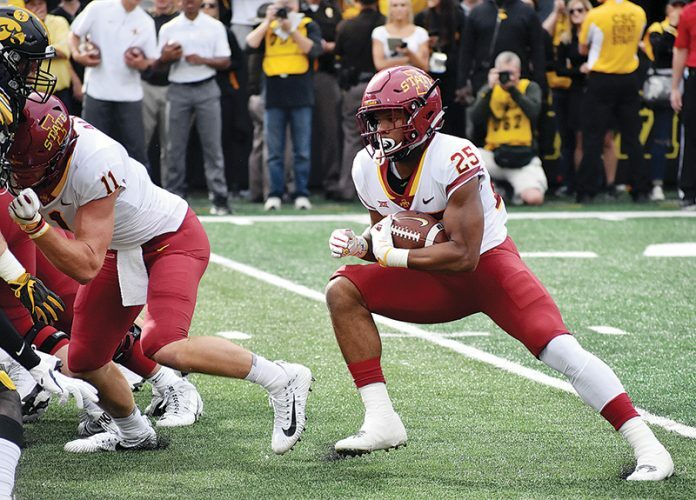 The second game was a welcome turnaround for first-year MCC head coach Anthony Everman, who was more worried about the way his team played than what a weekend split with Southwestern meant to the ICCAC Division I standings. Candido Encarnacion led the MCC bats in the second game with a 3-for-4 performance at the plate. He had an RBI double and scored three times. Coleman went 2-for-2 with a double, a grand slam, two walks, four runs scored and five RBIs, while Hagen finished 2-for-3 with a home run, two runs scored and five RBIs. Ryan Carter, Luis Menendez and Reece Blay each added two hits for the Tigers, who scored four runs in the first inning, five in the second, seven in the third and three more in the fourth. Marshalltown led 1-0 for much of the first game thanks to back-to-back-to-back singles by Encarnacion, Coleman and Carter in the bottom of the first inning, and a gritty effort from the mound by Diego Almonte. Almonte allowed just three hits over the first four innings before Southwestern’s five-run eruption started with an innocent spark — a bloop single that fell in between three MCC defenders. Levi Avery’s high fly ball behind second base landed in the triangle created by Coleman in center field, Travon Hughes in left and the shortstop Encarnacion. Avery stole second on the very next pitch, Almonte hit No. 9 hitter Isaac Esquilin, and leadoff batter Brian Soto bunted them both up a base. Sanchez ripped a two-run double to the gap in right, Almonte plunked another batter, and Ryan Doran drove in two more with his triple into the right-field corner. Jadriel Pantoja greeted MCC reliever Jimmy Kurka with a sacrifice fly to right, staking the Spartans to a sudden 5-1 advantage, but Kurka retired the next seven batters he faced to keep the Tigers in the hunt. “It didn’t seem like that big of a deal at the initial moment, but that’s when things started to go downhill,” Coleman said of the bloop single that sparked Southwestern’s scoring surge. Having missed its chance to expand on its lead an inning earlier, MCC tried to make up for it in its next at-bat. 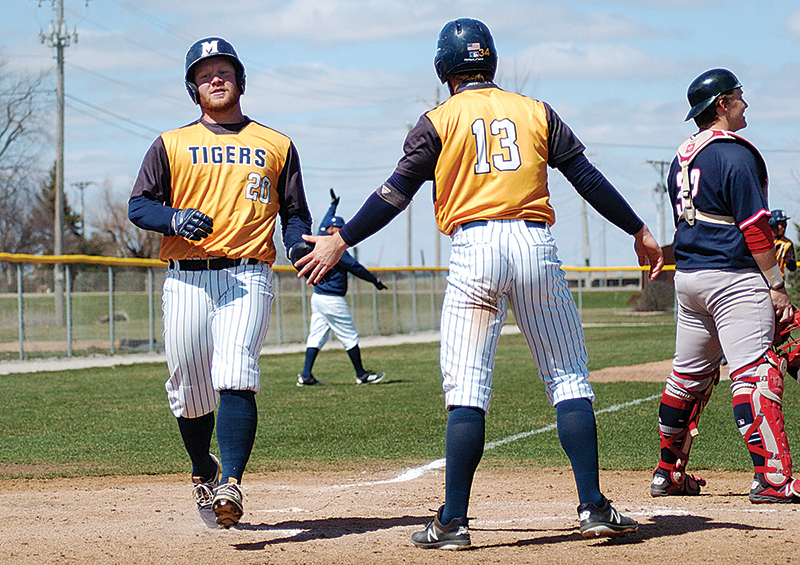 The Tigers stranded two on with nobody out in the bottom of the fourth, but Marshalltown followed up SWCC’s five-run inning with four straight hits. Josten doubled to left, Elijah Bergeron singled, Encarnacion blooped a single that loaded the bases and Coleman plated a pair with his check-swing single past Southwestern’s pulled-in first baseman. MCC failed to deliver the tying runs, however, as Encarnacion and Coleman were left stranded after back-to-back strikeouts and a groundout ended the inning. “We just didn’t make a few routine plays that I thought we could have,” Everman said of the opening-game loss. “I thought we had some opportunities and we left some guys on base when, if we capitalize there and drive them in, it could be a different game. Southwestern right-hander Elier Santana went the distance on the mound, allowing 10 hits — nine singles — with two walks and a hit batter but just three earned runs, striking out eight. Sanchez was the only Spartan with at least two hits as Almonte and Kirka combined to limit SWCC to six hits, although half went for extra bases. Josten, Coleman and Carter each had two of MCC’s 10 hits, but the Tigers came up shy of matching Southwestern’s one big inning of offense. For the day, Encarnacion, Coleman and Carter each had four hits while Josten and Menendez had three apiece as the Tigers batted 26-for-56 (.464) over the two games. “If we can just string along more performances like that, we’ll be fine. 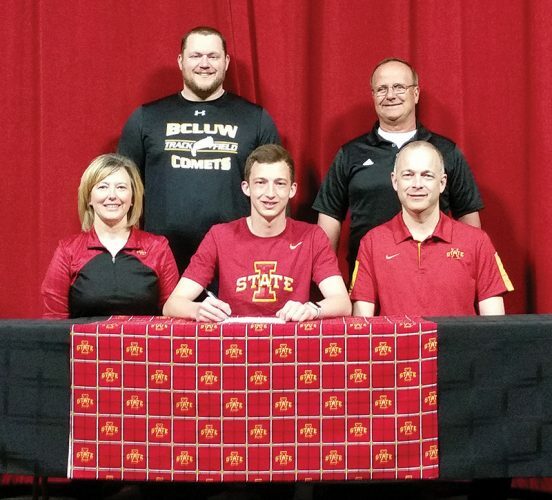 We have to be consistent with how we do things and our approach,” said Coleman, whose parents flew in from Victoria, Texas, for the weekend to see him play in Marshalltown for the first time. “It’s always really cool when you hit a grand slam. When you’re a kid in the back yard, you think of a grand slam and when that happens it’s kind of cool. 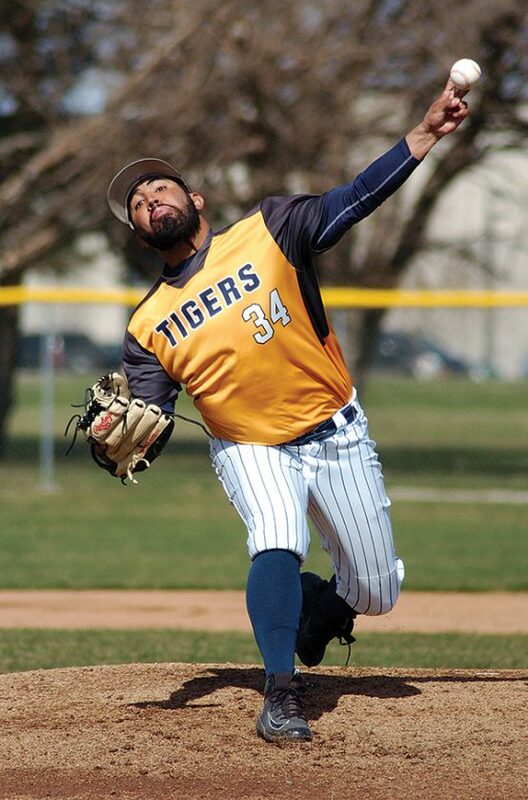 The Tigers get back to action with a single nine-inning game Tuesday against NIACC in Mason City. MCC faces Indian Hills in conference play this weekend with home games Friday and road games Saturday in Centerville. Elier Santana and Cade Cox; Diego Almonte, Jimmy Kurka (5) and Joel Torrealba. W–Santana. L–Almonte. 2B–SWCC: Frank Sanchez 2; MCC: Tom Josten. 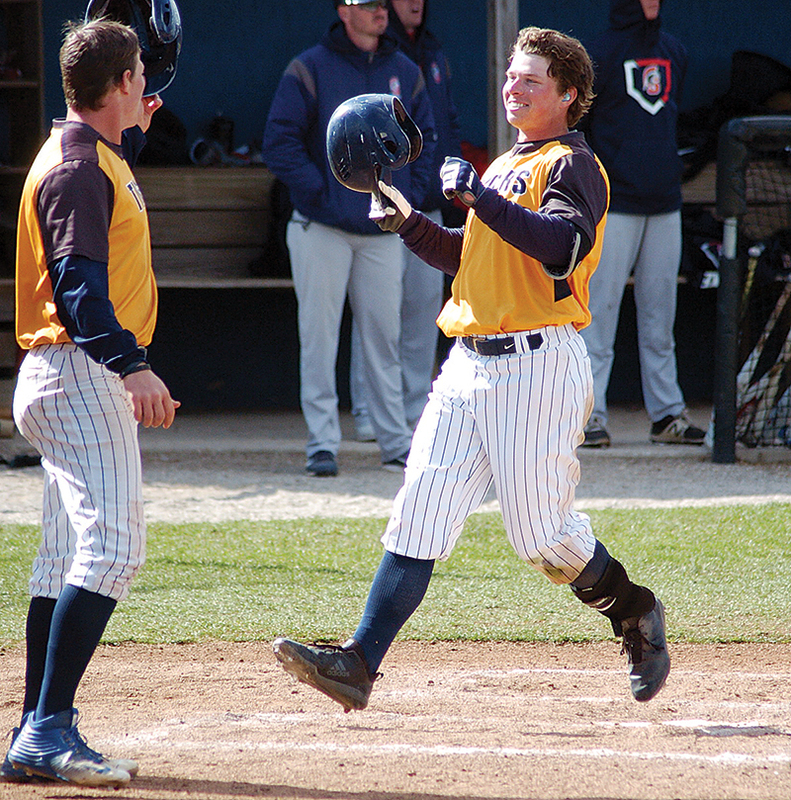 3B–SWCC: Ryan Doran. LOB–SWCC 4, MCC 10. Matt Smith, Quincy Collier (2), Luis Diaz (2), Jerry Velez (3), Jake Panich (3) and Cox; David Davila and Elijah Bergeron. W–Davila. L–Smith. 2B–MCC: Candido Encarnacion, Tyler Coleman, Luis Menendez, Quin Hall, Reece Blay. HR–MCC: Josten, Coleman, Nick Hagen. LOB–SWCC 6, MCC 7. T-R PHOTO BY ROSS THEDE – Marshalltown Community College freshman Tyler Coleman, right, is greeted at home plate by Ryan Carter after hitting a grand slam during the second inning of game two of Sunday’s doubleheader against Southwestern at Shawn Williams Field. T-R PHOTO BY ROSS THEDE – MCC shortstop Candido Encarnacion, top, makes a leaping grab and attempted tag as Southwestern’s Levi Avery steals second base successfully during the fifth inning of game one in Sunday’s twinbill.